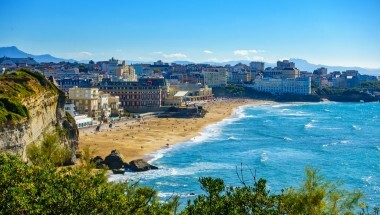 This Biarritz apartment to rent is situated in a quiet location, between the Sofitel and the Hotel du Palais, 6 kms from the centre of Biarritz and overlooking Miramar Beach. The shops of the Quartier St Charles are just a few minutes walk away. 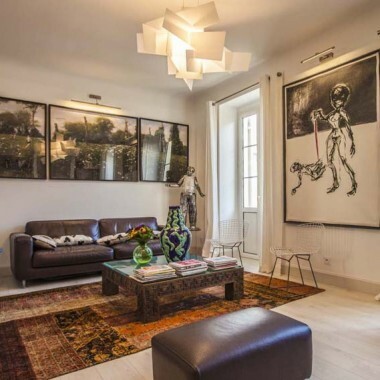 The apartment is on the ground floor of a 1920's house, and has been totally renovated. The living room opens to a beautiful, furnished terrace with views of the beach, and to the Biarritz lighthouse. The apartment also has two private parking spaces. The interiors feature high ceilings and a sophisticated décor with use of exposed brickwork, wood and polished concrete, to create a stylish ambience. Equipment includes flat screen satellite TV, DVD, Bose music system and i-pod dock. Living room, separated from the kitchen by a central island. Double bedroom, open to shower and basin area. Twin bedroom and small office area. Double bedroom. This to rent is in Biarritz is situated in a quiet location, between the Sofitel and the Hotel du Palais, 6 kms from the centre of Biarritz. The apartment overlooks Miramar Beach, and the shops of the Quartier St Charles are just a few minutes walk away.